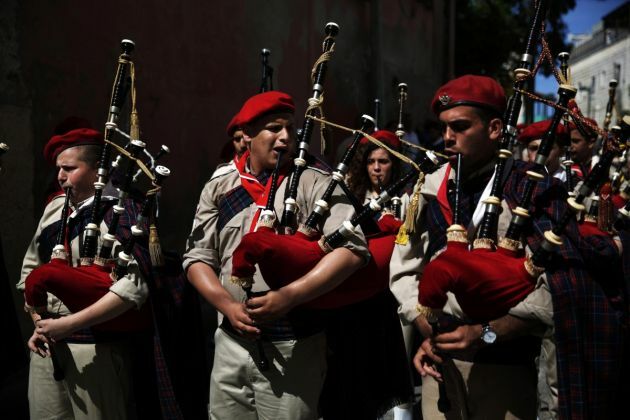 (Photo: REUTERS / Finbarr O'Reilly)Israeli Arab Christian boy scouts play bagpipes during an Easter Monday parade in Tel Aviv's Jaffa neighborhood, April 21, 2014. JERUSALEM (Reuters) - Israel said on Tuesday it was stepping up efforts to encourage military enlistment by Christian Arab citizens, a community long closer to the larger Muslim minority in identifying with the Palestinians. Israel's Christian Arabs number about 160,000, some two percent of the Jewish state's eight million people, and the expected number of conscripts - now about 100 - will rise in coming months, a senior military officer said. "We intend to appeal to the Christian population of conscription age (17 and 18) and will send them call-up notices to volunteer for service," Lieutenant-Colonel Amir Hai told reporters in a telephone briefing on Tuesday. Being mostly Palestinians themselves, Israel's Christian Arabs have traditionally stood alongside the Muslim community on Israeli-Palestinian issues. The Muslim minority comprises about 20 percent of the population and men of conscription age are largely exempted from military service. Hai said that all branches of the military, including elite units, would be open for the volunteers as long as they are suitable for the demands of the task. "No (unit) will be closed to (Christian conscripts) ahead of time, unless there is criteria that limits the recruit's ability to serve," Hai said. Only males will currently be called, although females were welcome to volunteer too, he added. "I welcome this important, historical step ... for the Christian community to be a member of Israeli society, equal in rights and duties," Father Gabriel Nadaf, head of the Israeli Christians Recruitment Forum, told Army Radio. Israeli Jews are obliged to serve in the military at age 18, with men serving for three years and women for two. The vast majority of ultra-Orthodox Jews are exempted on religious grounds, a divisive issue in Israeli society. Other minority groups that are called up for service are Israeli Druze Arabs and Bedouin Arabs. Sammy Smooha, professor of anthropology and sociology at Haifa University and a leading expert on Israel's Arabs, doubted the proportion of Christians in the military would not change. "The increase sounds impressive because the numbers are so small so far. I don't anticipate this will rise much further. There are greater numbers of Christians going for civilian national service options," he said. He described those enlisting as a fringe phenomenon driven by concern at the persecution of Christians in the Muslim Middle East and a desire for social advancement in Israel. Nadaf, an outspoken and controversial proponent for greater integration of Israel's Christians into Israeli society, said they wanted to be fully viewed as citizens of the Jewish state. "We are not Arabs. We are not Palestinians. We are Israelis, citizens of this country and we see ourselves as loyal to this country and its institutions as any Christian living in any other place in the world would," he said.